I very rarely purchase an item of clothing unless I can imagine wearing it in many different ways and for many occasions. I find that it saves me a lot of money, time and effort because it results in my full closet being at my disposal. Though it is true that I do own some items considered too casual or too formal for the work place, I try to keep that categorization to a minimum. If I buy something, it has to function for work and play. The best way to accomplish this is to buy items that I can dress up and dress down. The blouse that I am wearing in the following OOTD is something that I purchased when I was looking for interview attire. The print is what attracted me initially, but I also liked the modest neckline and sleeves. I have worn it to interviews by dressing it up with a grey crepe skirt from Eloquii, tights, black pumps, pearls and a fitted cardigan. It provided the perfect pop of color to my interview outfit. However, it also works well for a casual look, as you can see below. I wore with a high waisted skirt and comfy black flats to trek across campus and run some errands on a beautiful spring day. I think it's an adorable little poem, and I had a lot of fun with this assignment. It was a valuable experience composing a piece that was tailor made for my own voice range. I was so into it that I even wore my lonely leopard print dress for inspiration. I say lonely because it literally is the only item of clothing that I own in animal print. I'm not usually a big fan of animal print, but when I found this dress on clearance in Honolulu's F21, I knew that I had to step out of my comfort zone and try it out. It is a big change for me, but I like it. Perhaps I'll be inspired to try other animal prints in the future. Apparently I am in a Pink phase. I can't stop wearing it. I keep gravitating towards it, in all shades and textures. 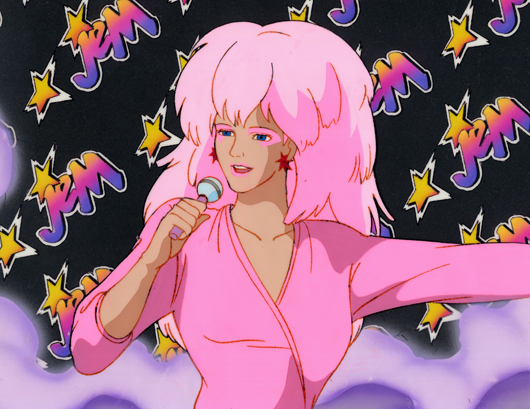 I need an intervention before I start looking like Jem's fat twin. I have not always been a big fan of Valentine's day. In fact, my sadness over being single used to manifest itself into a deep seeded hatred for the entire month of February. Even grocery shopping would make me grumpy as I was bombarded by displays of pink and red hearts stacked with cheesy gifts that I would not be receiving. If I happened to be in a relationship during February, I had a difficult time participating in what I used to consider such a shallow "holiday." I didn't understand the concept of waiting until mid-February to tell your loved ones how you felt. Why not do it year round? My thoughts on the "holiday" did not change until I met the man who showed me how to embrace romance, how to spoil and how to be spoiled at all times of the year. This man is the type of person who makes his cards by hand rather than buy them at the store. One of my favorites was this card from our very first Valentine's Day together. He wrote out every thing that he loved about me and included them in little strips inside of the card. There were hundreds of little strips of paper to read through. It was the sweetest thing anyone had ever made for me. This lovely gentleman that I speak of is now my husband. As cliché as it sounds, meeting him was the best thing that could ever happen to me. Perhaps one day I will share our love story, but for now, I'll leave you with photos of what I wore during one of our many romantic nights this weekend where we spoiled ourselves silly. Austin weather has been very unpredictable lately. I have been wearing clothes that keep me warm as I trek across campus, but that will not leave me sweating inside the classrooms. This outfit is perfect in that it keeps me warm and comfortable without being too hot. I visited the Forever 21 located in the Austin Domain that just yesterday started carrying the Forever 21 + Plus Size line. I am reporting back as promised! We couldn't find the plus size section initially. I asked a sales associate for assistance and she was very excited to show me the new addition to the store. With her help, I found my fat-girl-clothes heaven. Can you tell that I am excited? Forever 21+ Plus Sizes are now available in Austin! You guys!!! I am so excited to report that the Forever 21 store in the Austin Domain now carries their plus size line IN STORE. Before today, I would shop online or visit their stores in Houston. Now I can just drive down the street! I'm going to make a trip to the store today and check it out. I promise to report back. I am so excited! 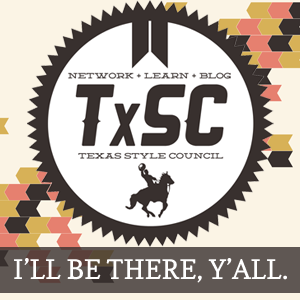 Can you believe that the Texas Style Council is in one more month?! Time flies! My Bestie is coming in to town to hang out with Lisa and me. It's going to be so fun. Will you be there? If so, say hello! This is my first OOTD ever! I'm even a little bit nervous about it, so please excuse my awkwardness. I can't imagine that I'll ever be totally comfortable in front of a camera, but we all have to start somewhere, right? Today's look features my favorite hot pink, jersey dress. It is so versatile in that it can be dressed up or dressed down very easily. It's also reversible, so it's basically two dresses in one! I found this hot pink dress in Maurice's clearance rack last year for $13. One side offers a cowl neck and the other side has surplice neckline (as shown). I found this in clearance at the back of Lane Bryant for a whopping $7. I wear this thing year round, but mostly because Austin doesn't really have a winter. I purchased this $7 belt while on my honeymoon in Hawaii. I was so excited to find a Forever 21 that actually carried plus sizes in store! I got these wide width flats at Payless during one of their BOGO sales. They are super comfortable! I found a bunch of amazing, plus sized bangles at Dots for 50% off, bringing these down to $3.50 for a batch of 15 (not pictured). Do you know how hard it is to find bangles that actually fit my giant wrist? It used to be impossible! I love foaming hand soap. We have been using Dial's Complete foam handsoap for a few years. Every time they would run out, we would replace them, bottles and all. I hated how wasteful this was, so we researched and found refill bottles. We felt a little better about re-using our plastic foam dispensers. However, we were disappointed to learn that the refill bottles were still very pricey. Through some experimentation using materials that we already had here at home, we were able to come up with the perfect recipe for the perfect, cheap foaming handsoap. I am extremely excited about the upcoming ElleX clothing line that features affordable, fashion forward clothing for the plus-sized woman. I am especially in love with the Rhonda Crop It Top. I imagine that it would be comfortable, casual and especially fabulous with the proper styling. Below you can see how I would wear it while trekking around campus. Have you seen the ElleX clothing line? What pieces are you most excited about?